… find great political books down at the old neighborhood bookstore! I found out as much the other day, as I was out hunting for titles about the candidates for president and vice president. 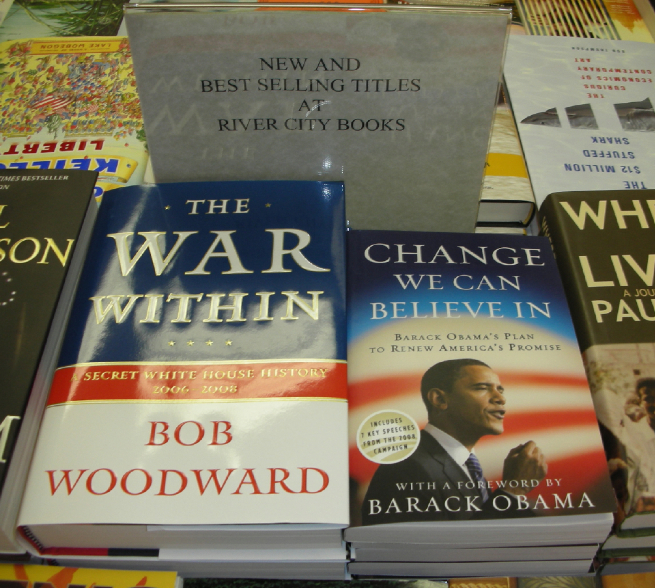 River City Books has titles written by and about John McCain, Barack Obama and their respective running mates. There are also terrific issues-oriented books as well as those about current world-shaping events. Has there been an election between two more different candidates — at least recent memory? Has there ever been a more important president election? Whether you vote Republican, Democrat, Independent or Bull Moose, I know you’ll find books that both inform and make you think. I always like reading local books and when I was in Carleton College-owned River City Books yesterday I found a new book that is as local as they come. 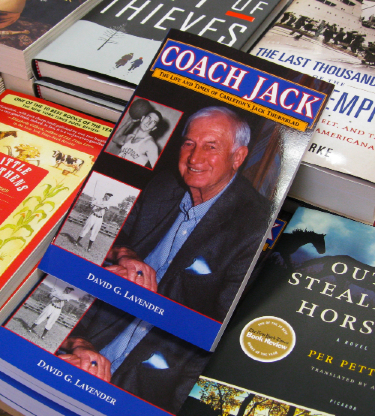 “Coach Jack: The Life and Times of Carleton’s Jack Thurnblad” by David G. Lavender is about one of Carleton’s most beloved coaches and alums that anyone with a tie to the college will want to check out. If you haven’t heard about the book What Happened let me be the first to formally welcome you back from Neptune. I hope you like the weather. The book, of course, is the latest political firestorm account — seems like we have one of those every six weeks or so — and it’s made news especially because it’s written by Scott McClellan, a rare administration loyalist to pull the alarm. It hasn’t been easy to turn on a radio, TV, or computer of late without seeing some reaction to the book and/or hearing an interview with McClellan. If you’d like to read what all of the interest is about — always a good idea, if you ask this humble bird — you know where to go any day of the week. I think this is pretty funny. The New York Times has posted a great round-up of new topical political books — just in time for the amazing race for president.